Good and friendly people. They want to live like many of us do with jobs, families and peace - only some five percent are radicals. Many are conservative, but not radicals. After the ISAF mission ended in 2014, the Taliban cannot win. For me the glass is about three quarters full. The Taliban lack the support of the people, have no viable vision for the future of the country. More bombs drive just the people away from them. The Afghan Army and police are fighting considerably well. A new young generation with smartphones is in charge, with better educations, including the girls. There are many media outlets reporting. The elections showed broad interest and support for the political process. After 13 years the Afghans have emancipated from the Taliban past. The Taliban lost long-time support from Pakistan and the ISI and safe heavens in FATA. The foreign troops have left with only a limited training mission still in the country. Now the battle is between the Afghans and not against a foreign invader. It is fairly easy for the Taliban to detonate bombs anywhere - but not possible to win the country, the north or large cities back. 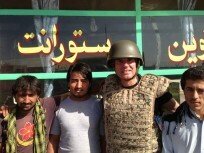 Afghanistan is still dangerous - but peace will prevail. The Taliban, alongside drug smugglers and criminals, are isolated now in the countryside in the south. Thank you to ISAF and to all the soldiers from Afghanistan and foreign countries involved for making this turnaround possible, with many losses from 2001 to 2014! The containment of the Taliban will be proceeding, including financial support. Corruption must be fought tirelessly and real reconciliation as well as peace-talks with the Taliban with Pakistan involved are necessary. My World Security Network Foundation promotes this since 2002.